Fairly recently I wrote a fairly a set of electronics tips ( Electronics Building Tips in 21 Plus Steps https://www.instructables.com/id/Electronics-Building-Tips-in-21-Plus-Steps-/ ). I worked on it for quite a while and finally published it just to get it done. But ideas kept coming so here are some more. I hope you find them useful. The web is full of free electronics references, Google and read. I have already mentioned datasheets and application notes. Here are a few more book like references. Electric Circuits 9th Edition Google shows downloads, which I think are legal. There are lots more go on the web and look. Not free but so good The Art of Electronics - Horowitz & Hill over $100 new, about half that used. Perhaps at your library, or you can get them to acquire it. They can give success when you are just building, and you may learn a lot. If you are building a stock circuit ( like the one in application notes ) a kit may give you a PC board and parts for close to or better than what you could buy them for. If it is a stock circuit you are not designing anything anyway. RBBB (Really Bare Bones Board)http://moderndevice.com/product/rbbb-kit/ is a kit version minimum Arduino, I have found frequent use for this as well. Group together orders to save on shipping which can often be half the cost of the order. Futurlec http://www.futurlec.com/ has great prices, good selection, reasonable shipping, and in my experience long shipping times, for them plan ahead. If you buy a part consider that 1) you may burn it up, 2) if you use one odds are that you will use it again, think about it, 3) look at quantity discounts sometimes they are very aggressive ( in the past I found a part where the total cost for 100 was much less than the cost for 20 ). And for assembled stuff Deal Extremehttp://www.dealextreme.com/products.dx/category.299~page.4 has some attractive items, mostly assembled. Top / Best DIY Electronic Stores & Suppliers by Fuzzy-Wobble https://www.instructables.com/id/Top-DIY-Electronics-Stores-Suppliers/ is a good reference. Shop around, deals differ a lot. There are many way for communicating with a microcontroller, but we almost always program them using some sort of serial cable. Arduinos often have a built in USB connection. This can sometimes add cost. The cheapest way to communicate is RS232 at TTL levels. This normally means you can go directly into the microcontroller pins., Consider doing this with cables. USB to RS232 adapters are easy to find and buy and so or RS232 to TTL. Having made up the cable you do not have to get microcontrolles with USB. You may also find one step way of going from usb to TTL serial. With adapters like this you can use cheaper boards like the really bare bones arduino. These are some links to get you started. Google "RS232 to TTL Serial Adapter"
When you take something apart in addition to taking pictures to help you put it back together put the parts in a jar. I have used boxes trays,... all of which are good, but I like the jar best, Put the top on and even if you knock it over the parts are easy to find. If the parts are too big for a jar you probably will not lose them, use nothing or perhaps now it is time for a box. Unless you are going to put the parts back real soon or only have one project at a time put a label in/on the jar. A simulator generates a mathematical model of your circuit from a schematic and then runs the model. If you use them you should still consider a prototype as the simulations are never the whole story, rarely capturing things like unintended coupling between circuits. A good bet, free, is LTSpice. Since you should always have a schematic of what you build I would recommend that you do it either in a simulator, or a PCB layout program. This gives the schematic added value. Remember that simulation is useful, but I does not entirely replace prototyping. Unintended coupling is not caught by a simulator unless you include parts to model it, and this is difficult as the coupling is not intended. One of the areas where a prototype may be useful. There are others that may or may not be just as good. If you are more or less stuck or need some good advice ask you question there. Best not to ask stupid questions ( yes there are stupid questions ). You have already done some research at least a few google queries and searched the particular forum where you are posting. Missing the good features above. Asking what is “best” instead ask what people would recommend for a person in you situation with a particular goal. Many forum members will not even read a question with a “bad” title. ( I am planning an insturctable in the next few weeks ) The old time 741 is still shown in many circuits, if you have them use them, but they are not good by modern standards. Coupling is when one circuit effects another circuit, here we are looking at unintended coupling that has a negative impact on the circuit. Sometimes this is from RF radiating through the circuit, but the most common is unintended coupling through the power supply lines, including ground. Breadboards have lots of stray capacitance which can lead to intended coupling, as well as other problems. If you do not get unintended coupling on a bread board you will probably not get it in the real circuit ( but you may get other problems ). Things you might look into ( google if you need more info). Look at signals with a scope, set on AC crank up the gain. Power circuits should have no noise. I had one circuit I could not tame until I added a ferrite bead on the offending component. If your circuit is acting a bit strange you should always consider decoupling problems. Sometimes you have a signal that is fine but for being offset with a constant voltage, and/or has the wrong range, it needs to be rescaled and/or shifted. The images here try to help you get the idea. The forth image shows the input vs output function for an amplifier with a gain of 2 and offsets of 3. You can mess around with voltage dividers but this type of work almost begs to be done with an operational amplifier. The most general circuit is the multi input adder/subtractor. It is a simple circuit, an op amp and a few resistors. It is a bit more complicated to understand than some other circuits and I had trouble finding good simple references. One input is for the signal the other for the bias ( probably from a pot ) you want to add/subtract. Simpler circuits are just the adder or the subtractor. The inverting adder is really simple, it can amplify while it adds and inverts. Two in a row can give you a non-inventing adder subtractor. Using an amplifier as a gain of 1 non-inverting amp gives you a high impedance input for your signal. So using 3 amps of a quad unit you can scale and shift while drawing minimal current from your signal. Step 12: Need a Temperature Sensor? Need a temperature sensor but do not have one? Just use a forward biased diode. Apply a bias current and forward voltage changes with temperature. Keep current low so the diode does not self heat. May want to scale and shift voltage to get to temperature. See Scale and Shift section. A transistor base to emitter junction, a trans-diode, may be used for the diode. The voltage out is only a few tenths of a volt, and the signal is just a fraction of this. Using an op amp to process the output is a useful idea. Step 13: Solid or Stranded? Wire comes in 2 flavors solid and stranded. If the wire is used in an application where it will not move used solid. Solid wire can be bent into shapes that it will hold and can make for neat layout. Use this for protoboard. If the wire will move and be flexed then stranded wire will stand up better over time. When you use stranded wire pre-tinning ( coating with solder before connecting ) is particularly useful. Solid wire stays in place better when you bend it, stranded is more flexible. This is one of the most ubiquitous wires around, stripped down into individual strands it can be very useful in bread boarding. But what if instead you want something for higher current like speaker wire? 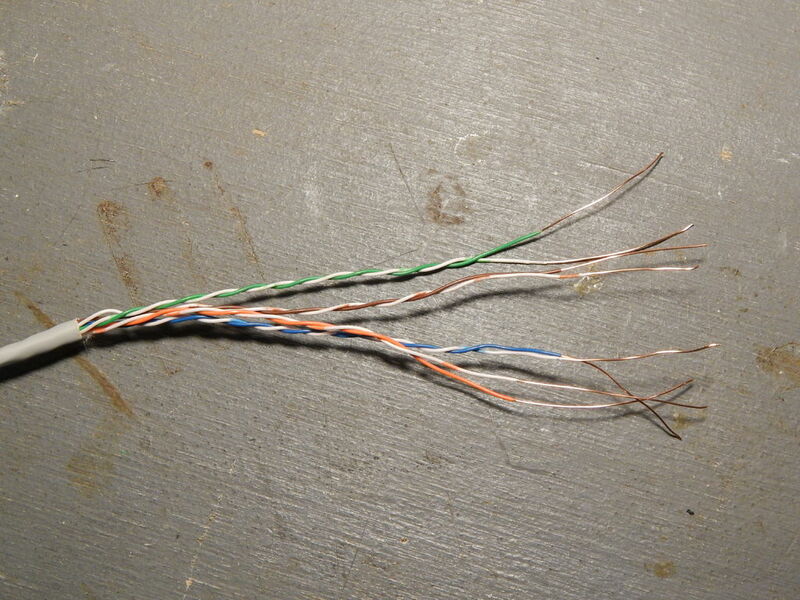 Cat 5 wire conductors are a bit small for this much current ( 24–26 AWG wire ). But wait! It has 8 conductors, if you put 4 of them in parallel in 2 groups you now have a wire that is OK for fair currents ( the gauge is now about equivalent to gauge 18 to 20 AWG ). I would not use it for voltages over about 30 volts because it is insulated for low voltages. Some of you may not know there are precision potentiometers which rotate a full 10 turns with a precise linear relationship between the angle of rotation and the resistance from one end to the wiper. Coupled with a special knob made for these you get a very precise voltage divider or with a bit of buffering voltage source. These are particularly useful coupled with a circuit that shows linear response. One example is the input resistor to an op amp integrator ( which may itself be part of a triangle wave generator ). There are also 10 turn trim posts, the point here not being calibration but to give a fine level of control. I ( in https://www.instructables.com/id/Electronics-Building-Tips-in-21-Plus-Steps-/step21/Breadboards/ ) mentioned that a project on a breadboard is not really finished, it is more of a prototype. and I suggested some alternatives. Here I will add a bit more. One building choice is a printed circuit board, either one you make ( a lot of work, but nice, see other instructables ) or one someone else made which makes things really easy and is typically what you get in a kit. These are great if you choose them but for now I will assume you are not using PCBs. Board with holes on it ( like stripboard and the boards mentioned in the reference above ) are nice because you do not have to drill to get access to the back. Choose boards with .1 inch hole spacing as that is what fits many standard pin layouts like dual inline ( dip ) sockets. When shopping for components also look for .1 inch ( or multiples or sub multiple ) because they fit well, and even if you later do a printed circuit board a .1 inch grid is usually helpful. When wiring on a breadboard there are typically power/ground rails at the top and bottom edge of the board. If you are just using perfboard to build you can still have power rails by running bare wire the length of the board and soldering it in place. Since many components need access to the rails this can make the job of wiring easier. See the pictures. Step 18: Need DIP Sockets? The dual inline sockets come set up for many different numbers of pins, from about 8 to perhaps 40. Often what you have is not what you need. So what to do? Many of these setups have the same spacing between the rows. This lets you mess around in how you use them. First if there are only a few too many pins, just leave the extra empty. Or perhaps you can put 2 chips in a really large socket. If you do not like extra pins you may be able to cut down the socket ( be careful sometimes the construction will not give a strong socket if you cut it ). If you need a larger socket, just consider using two. Sometimes this will work out great, a 16 pin dip in 2 x 8 pin sockets, but sometimes not quite as well, but there is no great sin in having a 14 pin chip sitting in 2 end to end 8 pin sockets. 2 empty pins, no big deal. You may even figure out how to make extra wide sockets from standard ones. Step 19: Lost a Part? You just had it in your hand, but cannot find it. Many ways to proceed but here are 2 more to consider. A small part on the floor can be really hard to find. To help lay a flashlight on the floor so its beam just grazes the surface. This causes the part to throw a long shadow which can make it easier to find. Look around you work space. Is it a mess. Clean up for awhile. Good chance the part will surface. When laying out circuits, especially on bread board, perf board, and strip board orient all the ICs so that pin 1 is in the same direction. ( this eliminates many insertion errors ). And write on the board to indicate which pin is pin 1. I have had good success using the female end of a computer hard drive cable ( a ribbon cable ) as a little mini proto board. Some people report difficultly working with them, but so far I have no problems to report. This is a technique I used in Third Hand for Your Multimeter by russ_hensel https://www.instructables.com/id/Third-Hand-for-Your-Multimeter/ which also has a couple of additional references. The typical design process involves quite a few calculations. For future reference ( change the circuit, fix mistakes ) consider doing the calculations in a spreadsheet just for that project and filing it away. In fact it is a good idea to save all notes, paper based or computer based for future reference. My project not often have some spreadsheet calculations, an eagle file or more, and various code files, and paper notes. I also tend to throw in some photos. Three terminal regulators are nice, but they regulate by dropping voltage through what is effectively resistance, This gives off heat, the power form the supply is partly dissipated in the regulator, and part is sent to the load. So if you want to drop from 30 volts to 10 volts at 1 amp there will be 20 volts at 1 amp dissipated across the regulator, or 20 watts. This may be within the current limitations of the regulator but not its power dissipation. A switching regulator which does not regulate through dispassion is one solution. A dropping resistor prior to the regulator may be another. Do not try to get any sort of regulation with a resistor only voltage divider. When mounting binding post and/or banana jacks keep in mind that the standard spacing is ¾ of an inch. There are some dual plugs that go in nicely if you use this spacing. Stick to the standard. Building a power supply and think you need a full wave rectifier? Maybe not, for low current where ripple is not too important ( which may be the case if you are using a 3 terminal regulator later in the circuit ) You can do just about a well if the single diode has a somewhat higher voltage and current rating and you double the value of the filter capacitor. Step 20: Isn't 'pin 1' on the opposite side of the IC than you indicated - i.e., with the notch on the IC facing North or 'up' then pin 1 should be the uppermost on the left side? So I looked at a few data sheets and you are right on, I am changing the photo, so if others see the comment the instructable is now correct. Good catch, thanks. And only caught because I have a small pile of smoked ICs that serve as constant reminder... Ingrained in my memory is when viewed from notch up, pin 1 on upper left, count pin assignments down left side then back up along right side - always. For example, a 20-pin IC has pins 1 and 20 opposite the notch and on the top left and right sides, respectively, when the notch is up. I appreciate the Instructables like yours that contain lost of tips and bite-sized information - good job! Thanks for your contibution, I appreciate it.